Honeymoon destinations: Why choose Rome? Because it is historic, romantic and eternal! From practical motivations to personal and poetic arguments, Rome is still one of the top of the best honeymoon destinations. Its charm affects equally foreigners and Italians equally, because each of us will find a reason to fall in love with Rome, choose it as our honeymoon destination or go back once again with our sweetie. Historic - Rome has been the first metropolis in the world history and it possesses cultural and artistic heritage, which has been built up during three millennia. It is the birth place of the Romance languages par excellence and the heart of the Christian religion. Rome is also an open-air museum, the perfect frame for your photos and memories, and it even offers a pinch of magic: go to the legendary Trevi Fountain, throw a coin, make a wish, and be ensured to return to Rome with your better half. Romantic - Why always Paris and Venice? Have you ever seen the ancient ruins at sunset? The Colosseum, the Pantheon, the Roman Forum, Largo di Torre Argentina, the Arch of Janus, the Portico d'Ottavia in the moonlight? And what about the view of the Janiculum hill? More romance can be found at the Milvio Bridge with its locks, or walking along the Lungotevere with the imposing Castel Sant'Angelo in the backgounrd. What about hiring a rickshaw at the park of Villa Borghese? Choosing the right moment to enjoy a glass of wine in an unknown bar/restaurant will transform Rome into the most romantic place you ever been to. Eternal - Rome is called the “Eternal City”, not only because it offers a representation of all historical and artistic ages everywhere throughout the city. But it has also been rebuilt by its own ruins, a symbol of strength and immortality, since even in the darkest periods of history, the importance and influence of Rome on the world have managed to survive. Eternal and immortal, strong and important - there two pairs of adjectives not only perfectly describe this ancient city, but could also describe the beginning of a life together, starting with this honeymoon. 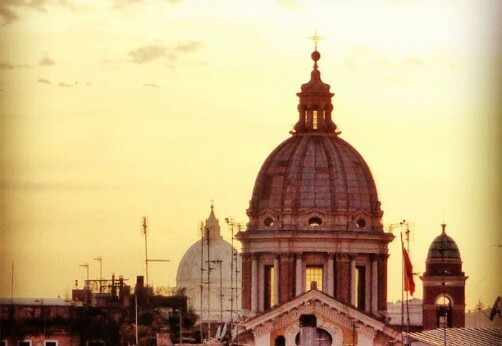 Among the many hotels in Rome, there is one accomodation that combines these three reasons and turns the Italian capital into a perfect destination for your honeymoon. It is the Hotel Rome Cavalieri. Located in a panoramic position, the hotel ensures privacy and exclusivity, but at the same time, it is only a few minutes away from the main historical and cultural highlights. Why the Rome Cavalieri Hotel is historical, romantic and eternal? It is historic, because it is celebrating its fiftieth anniversary and possesses an art collection which is met with envy by many museums. 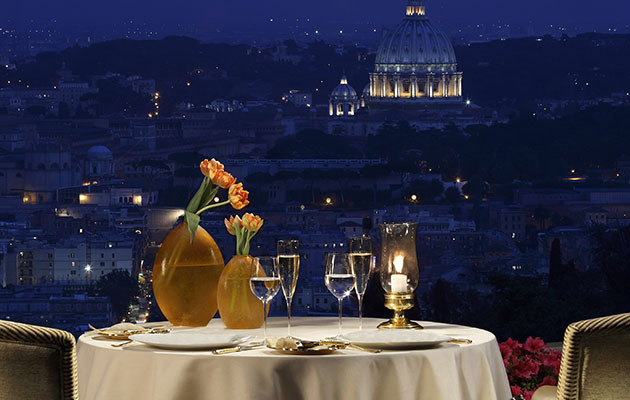 It is romantic, because it offers a 360° view of Rome. The view of its balconies and terraces, as well as the panorama of the three outdoor pools, is simply striking. To top it all off, the Imperial club, located on the 7th floor of the hotel, offers a breathtaking view of the surrounding landscape. It is eternal, because it is not only part of Rome’s history, but also represents a new concept of Italian style. Indeed, its furniture and decor are characterized by a mix of different designs. Eternal (in a metaphorical way) is also the park, in which the Rome Cavalieri is situated the immense location is characterised by 6 acres of lush Mediterranean vegetation. It is often said that it does not matter "where" you go, but “with whom" you have the pleasure to spend a romantic holiday. But, if the beauty of a destination, its hospitality and the high quality services of a 5-star hotel could accentuate the magic of your honeymoon, would you change your opinion about this saying? Discover Rome and find out for yourself.